Nutrition DL is a series that gives you the download on seasonal fruits, vegetables, or pantry staples. 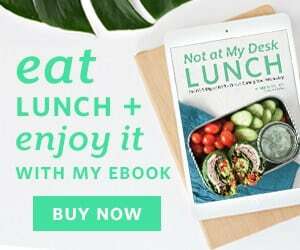 Once you learn about the nutrition, varieties, and how to select and store the featured ingredient, I share four recipes over four weeks to inspire and feed you with this great seasonal food. Check out other foods I’ve covered here. Certain foods just mark the arrival of seasons. When peas and peaches start to appear in the farmer’s market, I know summer is not too far away. Late spring and early summer marks the return of not one, but three varieties of peas (snap, snow and green/English peas). For this Nutrition DL installment, I decided to focus on one variety of pea and explore it a little more than splitting my attention between the three. Green peas, or sweet peas or English peas, are from the legume family. Most legumes are sold in a dried form, like chickpeas and other dried beans, making peas a unique legume. 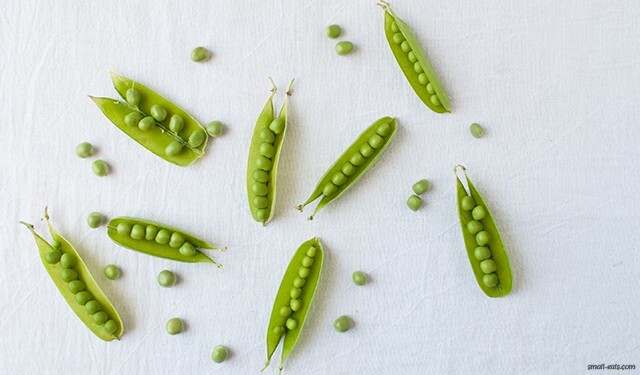 Green peas have way more benefits, vitamins and minerals than you would think! It’s hard to believe that such a dividing little legume could be just that good for you. Green peas are good sources of four kinds of B vitamins (B1, B6, B3, and B2). These B vitamins help with energy production, nervous system functions, metabolizing carbohydrates, and helps protect antioxidants. In addition to the antioxidant protection a green pea can provide, green peas are rich in antioxidants and anti-inflammatory nutrients. High levels of vitamin C is just one of the many vitamins and minerals that contribute to the great antioxidant levels peas provide. 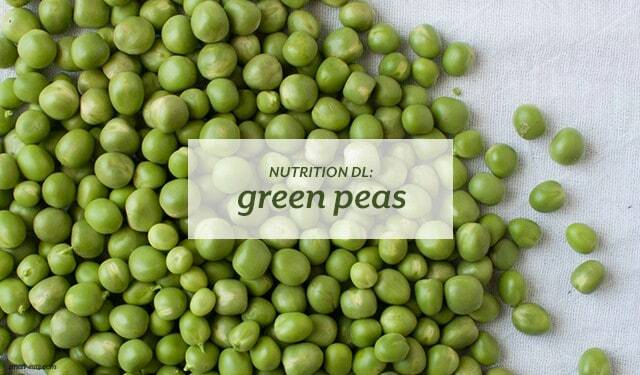 Green peas are also a source of plant-based ALA omega-3 fats. Omega-3 fats are anti-inflammatory and can help with heart health and decrease high blood pressure. Green peas are a great source of fiber. One cup of cooked peas has 9 grams, or 35% of your daily value of fiber. You’ll get both soluble and insoluble fiber from peas, meaning they’ll help you full and help keep you regular. Peas are slightly higher in insoluble fiber (the regulating kind). In addition to the filling fiber green peas provide, they also have a surprising amount of protein as well. One cooked cup has 7 grams of protein in it, which also help keep you full and satisfied. Green peas are also high in vitamin K, which helps healthily clot your blood and keep your bones healthy. Because we’re talking about one variety of pea rather than all peas (like sugar snap and snow peas), I thought I would highlight the different parts of the green pea. You can eat more than just the actual pea. Though I have yet to try it, you can eat the shell. It’s not as common of a practice yet, but there are people who cook up the shells as well and eat it. Others turn it into a puree and use the shells that way. I imagine the shells would also be great to save to add into a stalk. Depending on your farmer’s market or grocery store, you can also eat and cook with pea shoots. Pea shoots are the part of the plant that will eventually grow the pea pods at the end of them. They can be eaten raw or sauteed and have a light, delicate flavor. 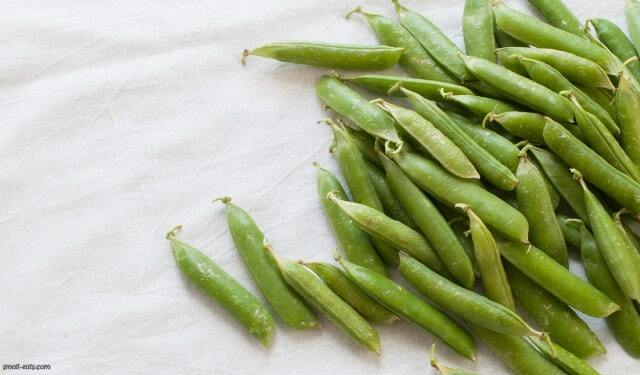 When it comes to buying fresh green peas, look for firm, bright green pods. Skip any open or yellowing pods. Make sure the pods you choose are mostly full and not empty-feeling (that could mean the peas inside are very small or non-existent. Store them in the fridge in a bag or container for a few days. Don’t shell them until you’re ready to use them. If your market is selling them unshelled (usually at a higher price), use them right away. The longer they’re out of their shells and raw the faster they’ll change flavor and get starchy. If you can’t find fresh green peas at your market or you need a lot of green peas, buying frozen, shelled peas is also a great option. Most frozen peas were peas that were from the season and not off-season. Make sure the kind you buy clearly states “No Salt Added” on the packaging. If not, the peas could have higher amounts of sodium used to help preserve the peas. Frozen peas are on the EWG’s Clean Fifteen list, which means that it’s safe to buy a nonorganic variety. When it comes to buying fresh peas, I would recommend going with organic/no-spray and no pesticides whenever possible. Check back tomorrow for the first recipe in this series!